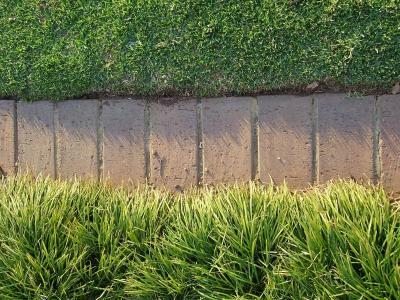 For a neat finish to any garden, use bricks as garden edging. Bricks come in assorted colors and finishes, and provide a quick way to incorporate pathways into different garden areas. The brick pattern depends on whether the bricks are laid flush to the ground or in a raised pattern. Bricks have multiple tasks when used as edging. Bricks help mark borders for flower beds, or separate shrub and tree areas in lawns. Bricks can also line walkways inside gardens to separate different vegetable growing beds. Install bricks as garden edging in different patterns depending on the overall look for the garden. Bricks are relatively easy to come by in home improvement stores, and are found in many different sizes, colors and shapes. Use the more colorful types to highlight major focal points in the garden and the more common types for edging long,f straight flower beds. Use any style to follow a large curve in a lawn. Three popular brick styles are building bricks, face bricks and pavers. Building bricks are the most common style. They are generally uniform in color with a smooth finish. These are cost effective for large areas needing borders. Face bricks have different colors with many finishes to choose from such as smooth, stippled or grooved. Paving bricks are good choices when you need different shapes such as squares. While typical bricks are dark-red in color, they are also made in shades of white, gray and brown. The color choice depends on how the edging will stand out when installed. Antique finishes give bricks a marbled or weathered look. Tumbled bricks have a softer look to them without their straight corners. A standard brick size is about 8 inches long by 3 1/2 inches wide, with a depth of 2 1/4 inches. Standard bricks are useful for long, straight borders given their even, rectangular shape. Pavers are more decorative, but have a thinner depth making them useful for flat, stylish edging. Three common edging styles are straight edging, curved edging or sawtooth edging. To begin, mark out the areas and dig out space for the bricks using a flat shovel. If the brick edging will be flush to the ground, measure the depth of the brick and remove enough soil to keep the bricks even with the ground. If the brick edging will be above the ground, remove just enough so that the edging will have a uniform border. The easiest style is laying the bricks as straight edging. Mark the garden edging path in a uniform, straight line. Dig along that line and insert the bricks side by side. This style is best for flat areas as the tops of the bricks will be level to the ground. You can create a curved edge by angling the bricks slightly against each other to form small curves, large arcs and full circles. The spaces in the open angles can be back-filled with dirt to hold them in place. This attractive style looks best when you use standard rectangular brick shapes. To create a sawtooth edge, you need to lay the bricks standing against one another at a 45 degree angle. When the bricks are laid in this fashion, a pattern emerges with little triangles surrounding the garden beds. The advantage of using bricks over other garden or lawn edging, such as natural or chiseled stone or wood, is that bricks are uniform in size and will not rot. Bricks fit with many different garden styles and come in assorted sizes and colors. They are used in both straight garden beds and curved ones. Another advantage to using bricks is that if you change your mind about the design of the gardne, bricks can be moved. You can also recycle bricks if you decide later to remove the garden bed all together. With their durability and wide range of styles and colors, bricks make attractive borders for many styles of garden beds. Brick pavers can be arranged in different patterns for patio areas and used as walkways connecting different garden beds together.